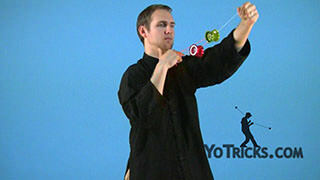 Learn the 3A trick known as Koro Koro. Just like that. Now, when you first learn the trick, you want to learn how to set the trick up and how to dismount. 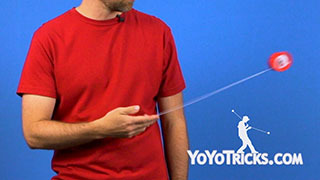 Once you get a feel for that, then you can learn the rest of the trick. Now, setting it up is pretty easy. 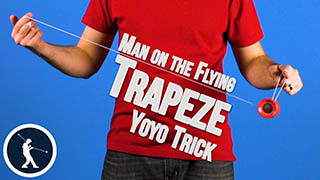 We will throw a breakaway, with our non dominant hand and with our dominant hand we are going to do a trapeze. We are going to bring our hand over and grab the loop, just like this. 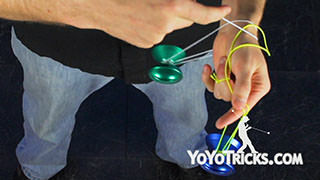 While our non dominant hand is in a breakaway we are going to put the yoyo into the loop from the back. 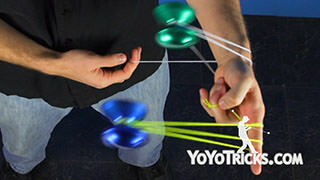 So you can see essentially we are in a trapeze over the other yoyo. To dismount, we are going to bring our hand towards ourself. 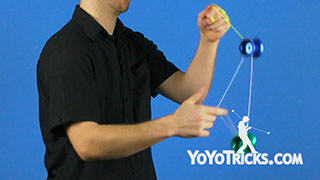 We are going to unmount the yoyo away from ourselves. 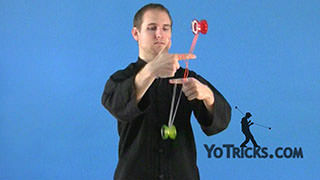 So that kind of brings the yoyo off plane and makes it swing towards your body. That prevents any knots from occurring. At the same time, you have to take your non dominant hand. 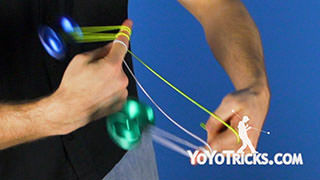 Unloop the string, essentially rotate it up into the air and that also prevents any knots or colliding from the yoyos happening. So it is a good idea just to learn that. So you put it all together. 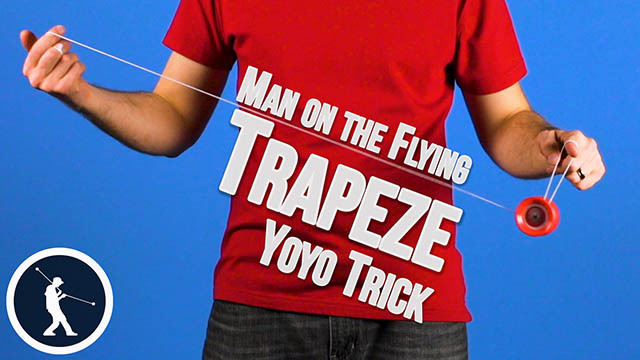 I grab the string, I take the yoyo I inserted and move my trapeze. I practice, there we go. 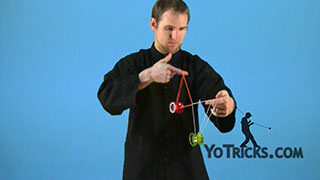 I dismount the yoyo away from me, I unloop it. 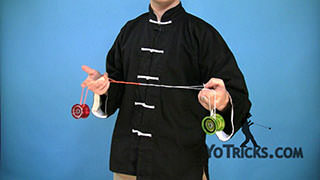 Bring the yoyos back to my hand. 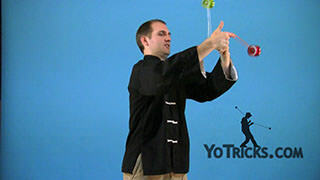 Again, practice that, get comfortable, and now you are ready to learn the next part of the trick, which is the rotation. So to rotate, all you are going to do is take one hand at a time and you are going to raise it and you are going to lower the other hand. 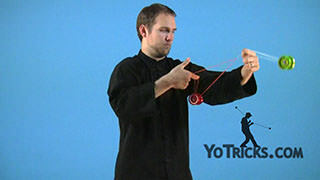 As you do that, the yoyos are going to rotate two times. One, two. 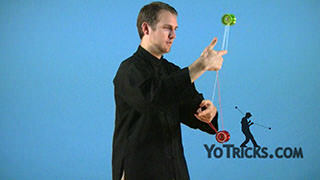 Then you will switch, raise the other hand, and it will cause the yoyos to rotate the other way, one two. You can keep doing that as many times as you want. Good idea to practice just a couple of rotations and then dismount. As you get better, add some more. Now, the biggest key when you are doing this is to make sure that your hands stay on plane, nice and even, straight up and down. 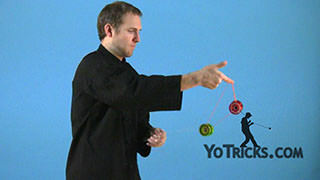 If you move one hand forward or if you move a hand back towards yourself, it will cause the yoyos to go off plane, and they will miss the strings. 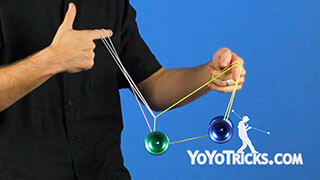 The other thing is you want to make sure that the yoyos are very close to each other, and that they are relatively on the same plane. If they are too turned like this, the trick is not going to work out. So they have got to be pretty straight. So once you have got it, you are going to get into your mount here, up, over, and dismount. Just like that. 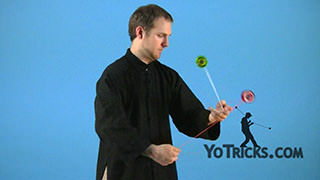 In one sense, this trick is very easy because you are just moving your hands and the setup is pretty easy to get into. In another sense, it is very hard for two reasons. 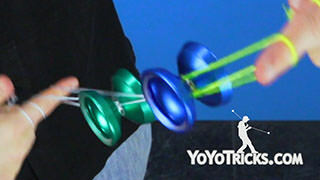 One, you might find your yoyos, they are going to hit together and it is going to ding them. 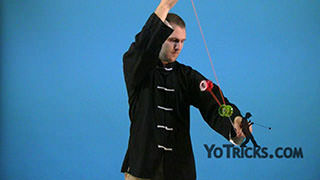 When I first learned this trick, I practiced on some Sages. So you might want to try doing that. 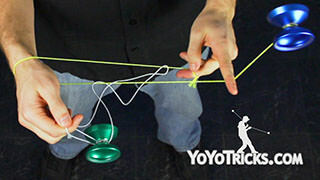 The other reason it is difficult is that at some point, inevitably, one of the yoyos is going to miss the string. 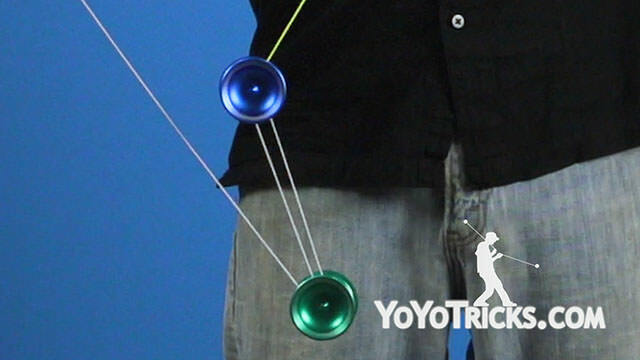 Could be on the front side, on the back side, and it could be either yoyo. It seems like it gets into a knot, and that the whole trick is just messed up. 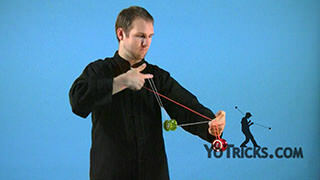 But if you stop and just hold your position, and you try to find out where the string is as it is coming over the yoyo, you will see that it is wrapping around the other yoyo on the front or the back, and either underneath or on the bottom. 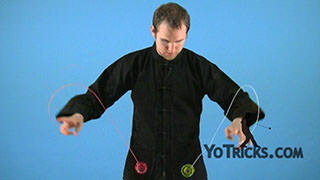 So you will know exactly which hand has to unwrap the yoyo, either from the top or bottom and on which side, away from you or towards yourself. It just takes a little bit of practice and some thinking to get used to that and to know how to undo those little knots. 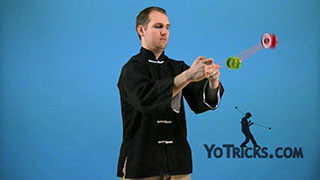 But you will find that it is much easier to practice the trick if you take the time to learn how. 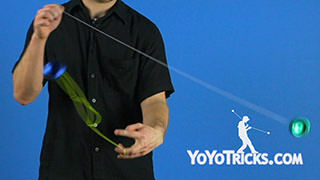 And so that is all the tips that there are to this trick. Again, you just have to practice it, and that is how you do Koro Koro.